If your invited to the actual religious wedding ceremony while you don’t have to wear a sari or Indian attire, it would be greatly appreciated if you did. Whatever you decide dressing modestly is a must. That means no bare shoulders, plunging necklines and short skirts. Besides, you may be required to sit cross-legged on the floor and this will prove difficult in tight or short clothing. For the Reception party you don’t have to be so cautious and can go all out and wear the brightest colors and fanciest outfit with all the jewelry you own. Generally wearing pure white and black are avoided during the wedding. White is worn at funerals, and black signifies mourning. Weddings are festive events, and bright colors are always welcome and considered auspicious at a joyous event. Try not to wear bright red as this is traditionally reserved for the bride and you wouldn’t want to outshine her on her special day! Several ceremonies, such as a Sikh wedding, usually require you to cover your head when you are in the temple. Carry a long scarf or a pashmina stole, which can also be used to cover up bare shoulders or arms, if necessary. Men usually wear the head covering provided at the temple or carry a large white handkerchief to place over their head. Most religious places require you to take off your shoes and place them in the designated space before you enter the sanctified area. While some places may require you to be barefooted, usually wearing socks or stockings is acceptable. Check before you get clicking during a ceremony. Mostly it should be fine, but during some of the rituals, particularly in a Hindu ceremony, even the official photographer may be barred in order to avoid distracting with the flash of the camera. During a Sikh ceremony held at a gurudwara (Sikh temple) or even some Hindu ceremonies, you may be given blessed food called ‘karah prashad’, which is made with flour, sugar and ghee (clarified butter). It is received in cupped hands or in your right hand and eaten by transferring it into your other hand and eating it with the right. If there is no gift mentioned on the invitation, Then it is perfectly acceptable to give a monetary gift to the couple at an Indian wedding. Usually this is done by placing money or vouchers with a card or a note into a pretty envelope or embroidered bag, along with best wishes to the couple. Numbers that end with numerical one are considered lucky, for instance, Rs.101, Rs.501, and so on. If the ceremony is at a Hindu or Sikh temple, you will mostly be served vegetarian food. 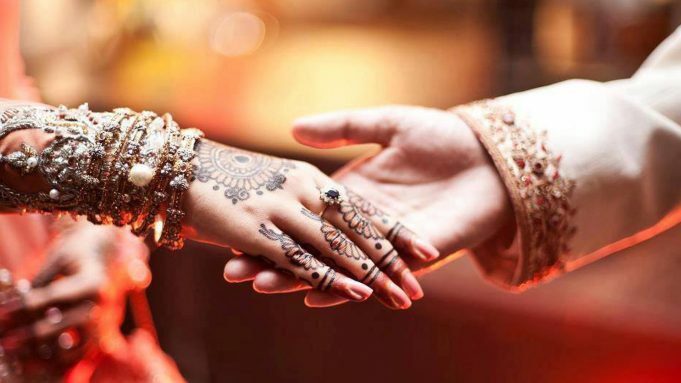 Other wedding celebartion days like the mehndi or sangeet non-vegetarian is served depending in the family preferences. Jain weddings are strictly vegetarian. At muslim weddings, you can expect the meat to be halal, but there are sure to be vegetarian options as well. It is best to accept only what you can eat and it would be rude to eat nothing at all, since taking part in the wedding feast as a guest, is a part of bringing good luck to the couple. It is not generally a custom for male guests to kiss or dance with the bride. Even the most liberated bride will follow the custom of being demure on her wedding day and it’s best to respect tradition on this. Have fun and and enjoy the experience! Don’t worry too much about offending anyone’s sentiments as almost everyone is understands that your not aware of all the traditions…so no one will hold anything against you! They’ll be honored that you attended and treat you like a welcome guest or even family. No one will mind if you ask questions about various aspects of the ceremony or about what is required of you. So relax and enjoy the colorful experience of being a part of an Indian wedding!